From the feathers on their head to the claws on their feet, Adèlie (pronounced A-dèl -ee) penguins are magnificently adapted for a life on land and in the sea. Standing 18 inches tall and weighing up to 12 pounds Adèlie penguins are well suited to withstand the Antarctic environment. For 9 months, Adèlies explore continental shelf waters in search of shrimp-like crustaceans called Krill. Drifting sea ice provides a place to rest and huddle while seeking out their favorite meal. From October through January, which is the Antarctic Summer, Adèlies return to their home on the islands along the western peninsula to breed. Here they build pebble nests and raise their chicks in coastal areas safe from predators. Scientists from the Palmer Long-Term Ecological Research station have been closely monitoring this colony of Adèlies. But recent decades show some troubling news. Over the past 30 years, the number of breeding pairs has dropped more than 80%. What could cause such significant change? Studies show that since 1950, the western Antarctic peninsula winter has warmed 11˚F, five times the global average. This warming trend is decreasing the amount of sea ice that forms and shrinking the habitat where young krill grow. This puts the Adèlie food supply and their breeding success at risk. Complicating matters, Gentoo and Chinstrap penguins, which favor conditions with less sea ice, are taking over some of the Adèlie colonies in this area. To gain a better understanding, scientists have turned their attention south where seasonal sea ice is still common. There they are tagging and observing successful Adèlie breeding colonies in hopes of pinpointing the animal’s response to a changing climate. Adapted to the rhythm of the sea, Adèlies are intimately connected to a life that includes sea ice and krill. 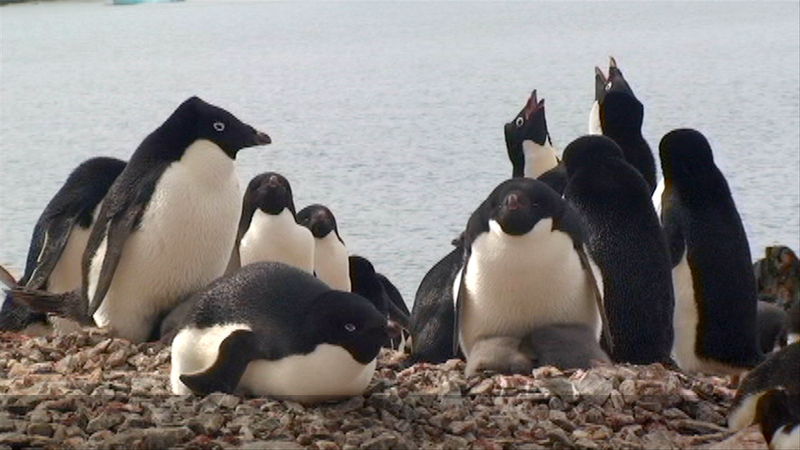 As climate changes the ocean ecosystem around them, life on land and the sea for these Adèlie penguins is shifting.